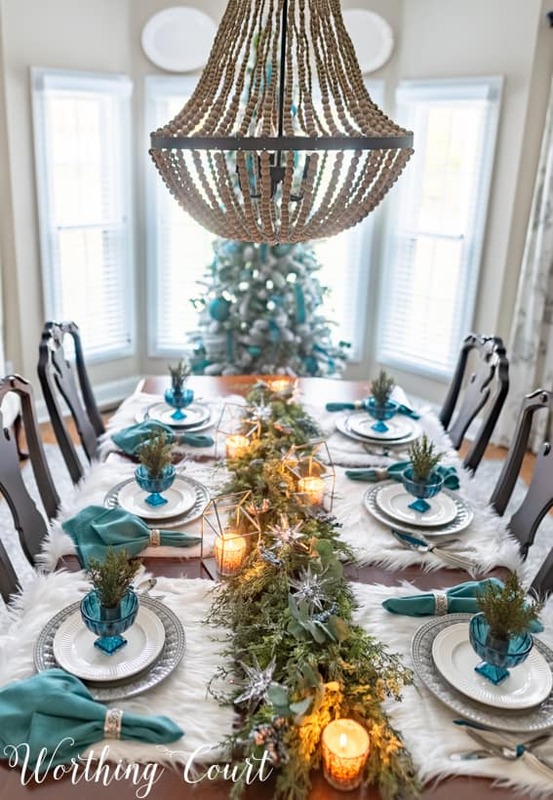 An elegant Christmas dining room filled with teal decor, a lush tablescape and snowy flocked trees. This post contains affiliate links. See my disclosure HERE. Similar items have been linked where the exact original is no longer available. 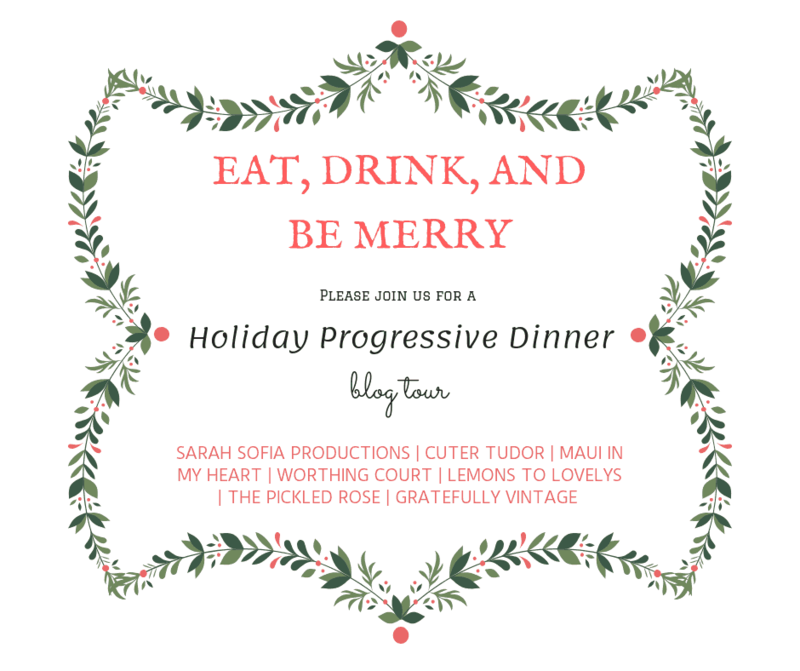 Allow me to welcome you to the Holiday Progressive Tablescape, Dinner and Entertaining Tips blog tour! If you’re coming over from Maui In My Heart, I’m so happy to have you over for a visit to Worthing Court! Didn’t you just love Debbie’s table? 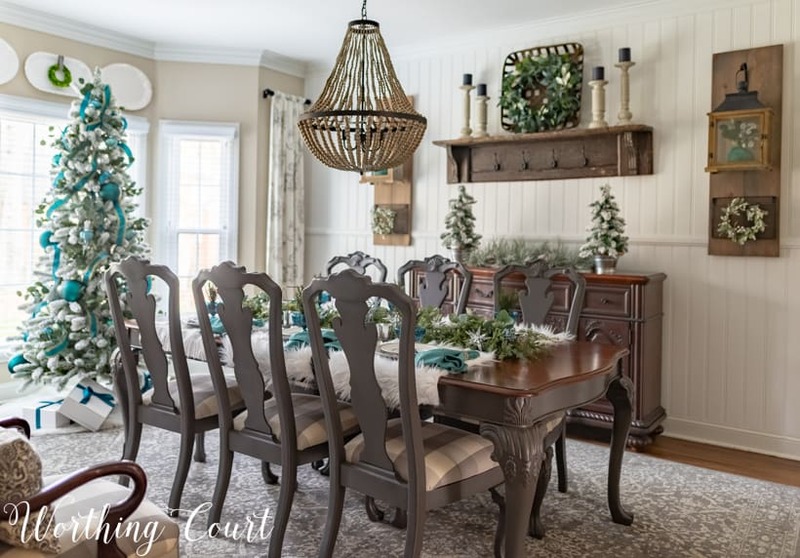 Let me show you around my Christmas dining room. 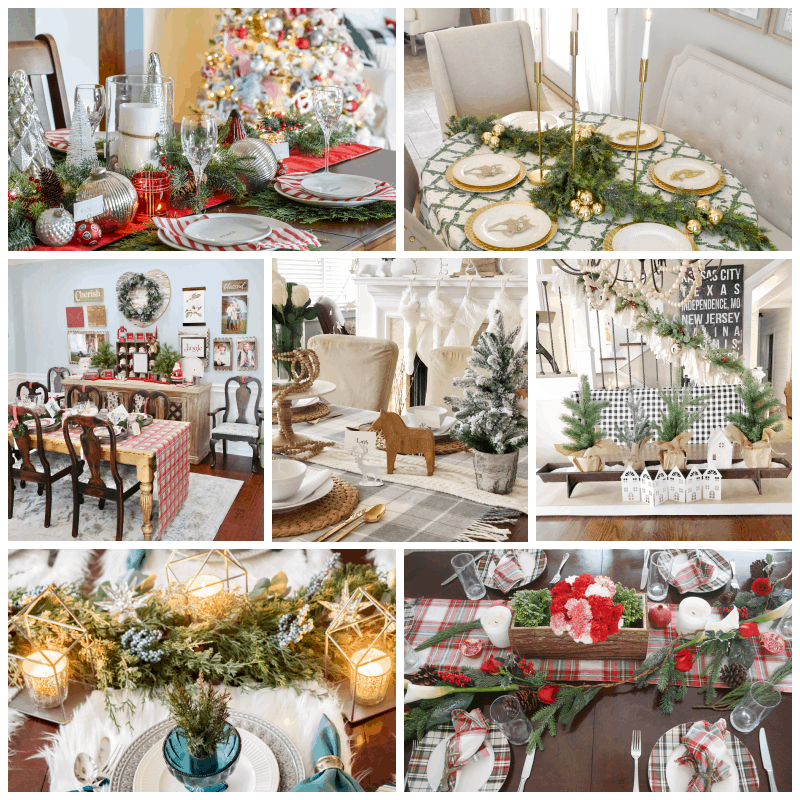 To say that I’m swooning over the decorations in here this season would be an understatement! To me, this is the most magical room at Worthing Court this year. For my family, the rest of the house is decorated with Christmas red, white and green, but I claim the dining room as my own! I tend to treat it as a more elegant space and the decorations in here this Christmas certainly reflect that. 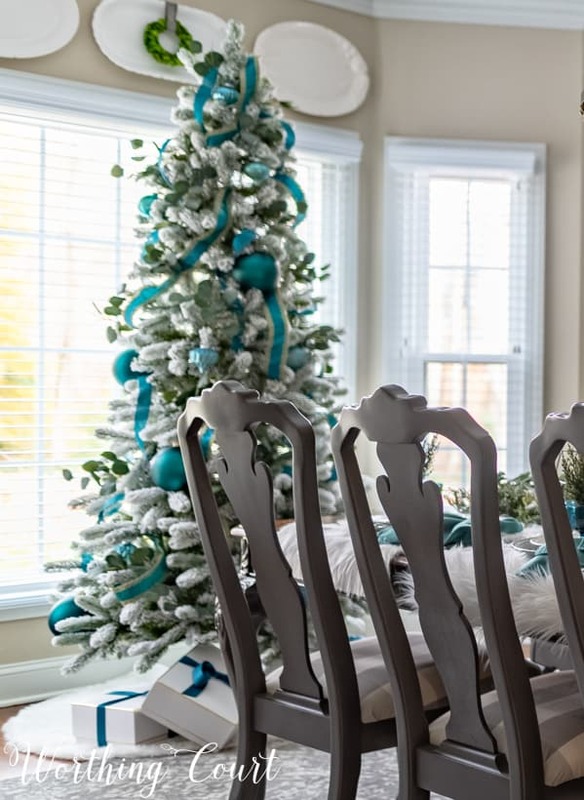 The inspiration for the entire room came from my gorgeous new flocked tree! As soon as I opened the box to its snowy goodness, I knew right away that teal would be my color of choice for the decorations on it. The star of the show is definitely the table! 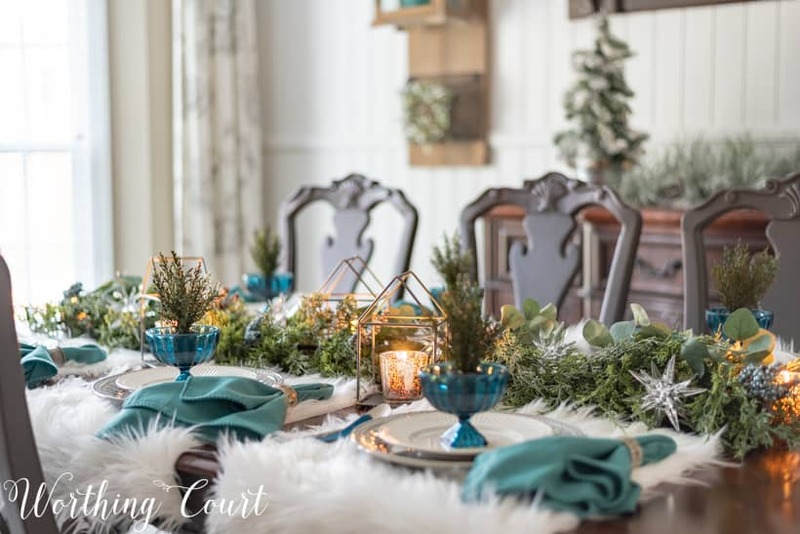 I created a tablescape that is every bit as lush and full as the tree and is reminiscent of a walk in a snowy forest filled with sweet smelling cedar and pine. 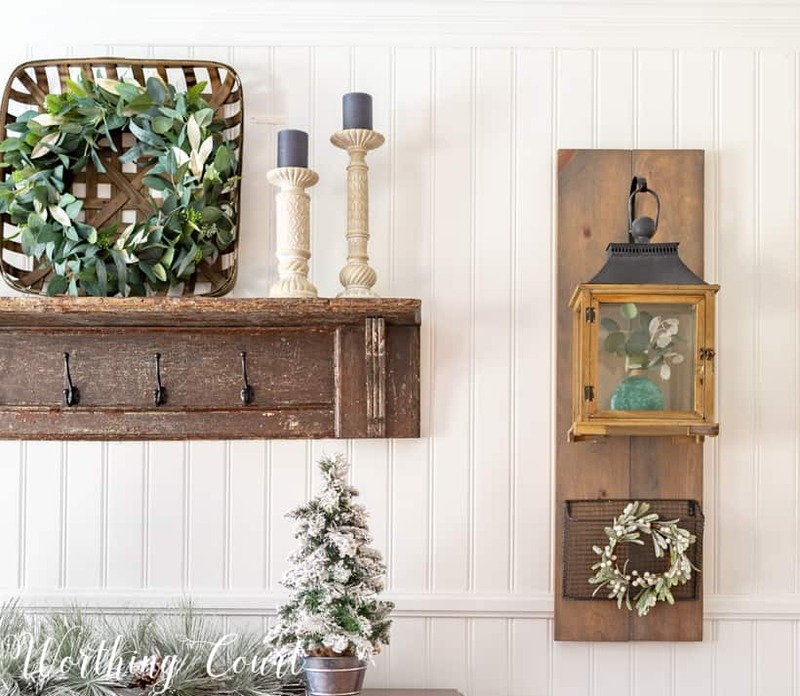 The thick mix of artificial greenery in the garland is another reminder of walking in the woods where the ground is a soft blanket of fallen leaves and branches. The garland originally had bunches of red berries in it, but I cut them out and added a few sprigs of juniper-look berries from a spray that I cut apart. 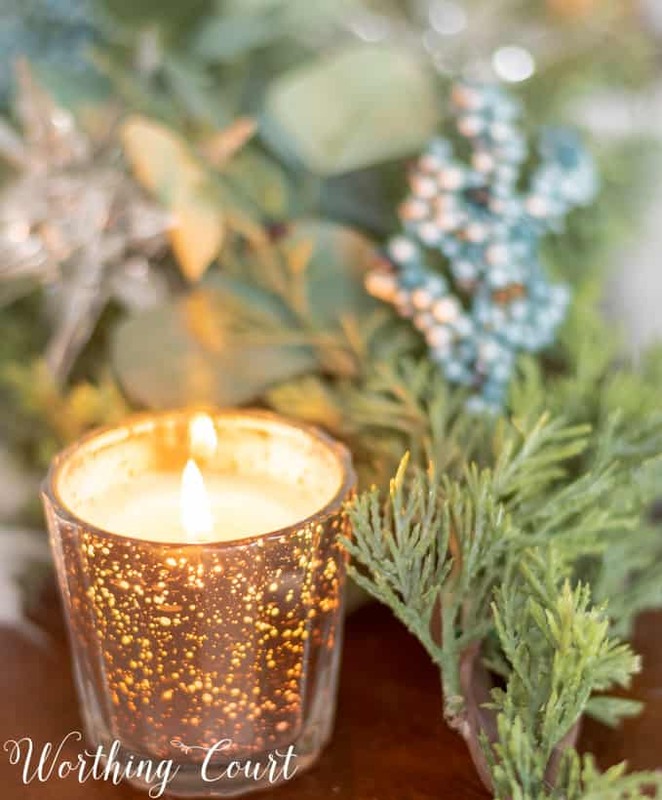 Christmas and candlelight go hand-in-hand during this season, especially when it glows and sparkles in mercury glass votives. Placemats that are cut from faux fur yardage set the snowy scene. Each placemat measures 21″ x 18″ and is turned sideways so that a few inches hang below the surface of the table, giving the edges of the table a soft and cozy vibe. 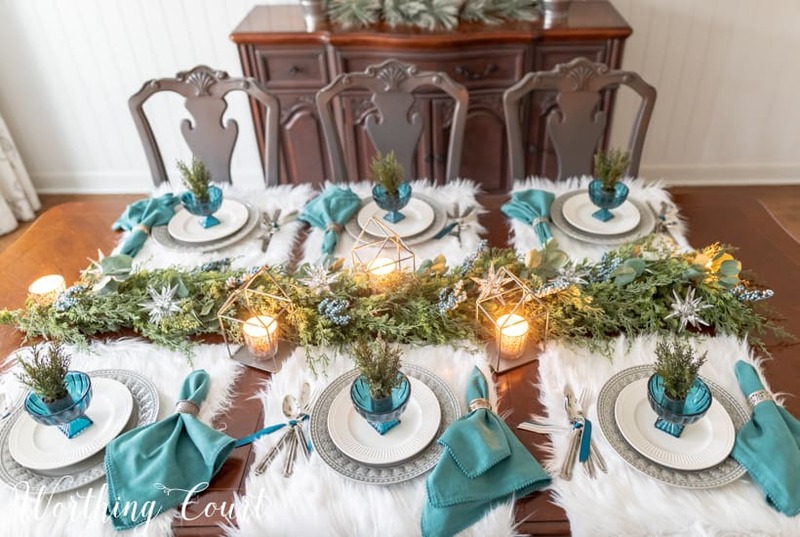 Each placemat is topped with gray dinner plates with a beautiful detailed edge, a salad plate from my everyday dinnerware and a teal colored dessert bowl that contains a mini juniper tree. 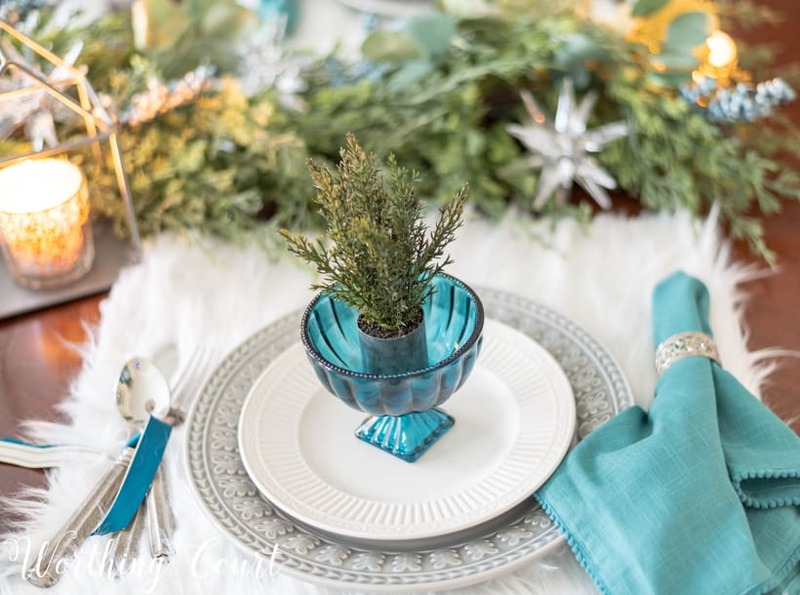 Silverware is gathered together and tied with a combination of teal and gray and white striped ribbon. 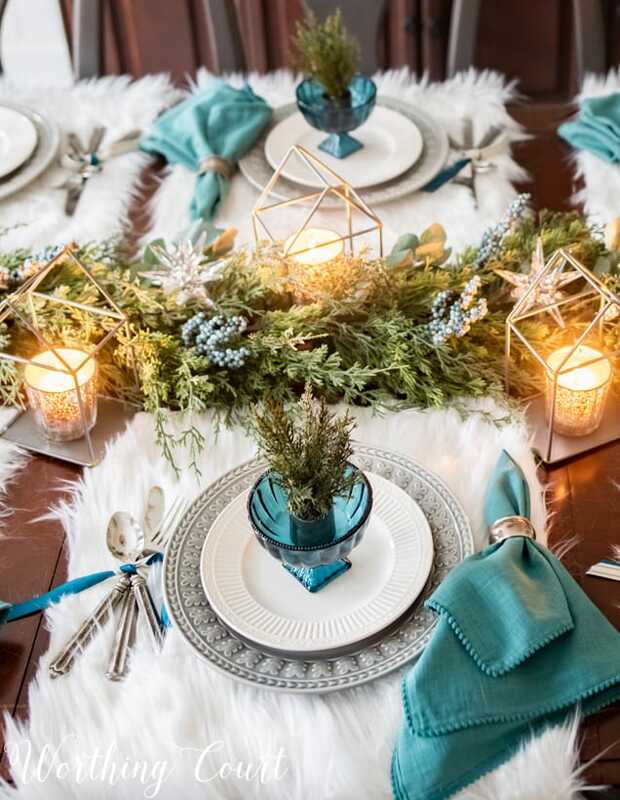 The teal napkins are loosely gathered and adorned with vintage silver napkin rings. Don’t you love the sweet pompom detail along the edge? The dining room table puts on quite the show, so the decor on my sideboard is kept on the simple side. My vintage shelf is decorated with candlesticks and gray candles that flank a eucalyptus wreath hanging in a tobacco basket. I tucked a few shimmery leaves into the wreath to dress it up for Christmas. A pair of mini flocked trees act as bookends to the snowy pine garland on the top of the sideboard. Normally, the lanterns contain a large white candle and the baskets below them are filled with seasonal plates. 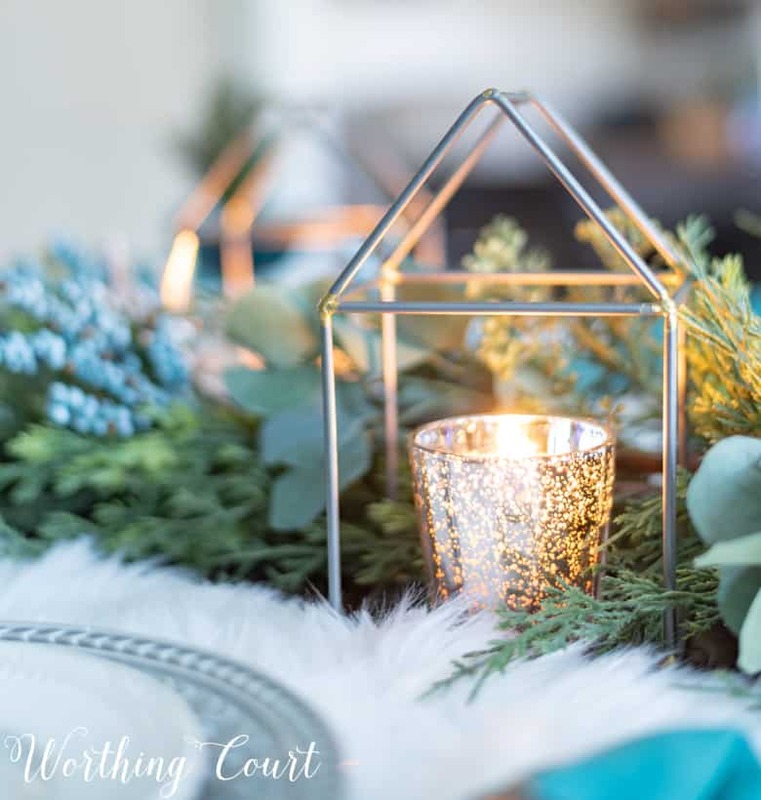 But this year, I hung a simple frosted candle ring on the front of each basket and filled each lantern with a teal vase and eucalyptus leaves. Thank you for coming by for a visit today! Next, head over to Lemons To Lovelys for more amazing dining inspiration! What an absolute treat to be a guest at this gorgeous table. You have taken elegance to the next level. Thanks for sharing all your amazing inspiration. Thank you so much, Kristi! Glad you found some inspiration! I’ve always loved the combo of any shade of blue and white! Thank you for your sweet comment and for putting this blog tour together! Suzy, what an elegant table. It looks so beautiful and inviting. I wish I was going to be a guest. I think my favorite part are the placemats you cut from faux fur…genius!!! I want to try that. Suzy your table is absolutely stunning!! I love that you used teal! I would love to dine by the glow of that gorgeous tree! Such a great tip to use faux fur…I’m totally going to try that!! Suzy, your table is just gorgeous! The colors are just beautiful and elegance is just pouring from this space! Would love to come and dine here as a guest. You have really seen to every detail and it shows. Hope you have a wonderful Christmas with your family! Thank you so much, Sue! I’d love to have you as a guest any time! Merry Christmas to you and your family as well! How gorgeous! I love the teal. You did a beautiful job. Thank you so much, Jan! You have done an excellent job of creating such an elegant dining room!!!!!! One of my colors I use is Teal and Coral. I do love teal!!! It looks so good with the grey and the fur placements. Did you just cut the square out and leave it like that or did you have to sew the edges? I would have never thought of that brilliant idea!!! Another texture to the layer. 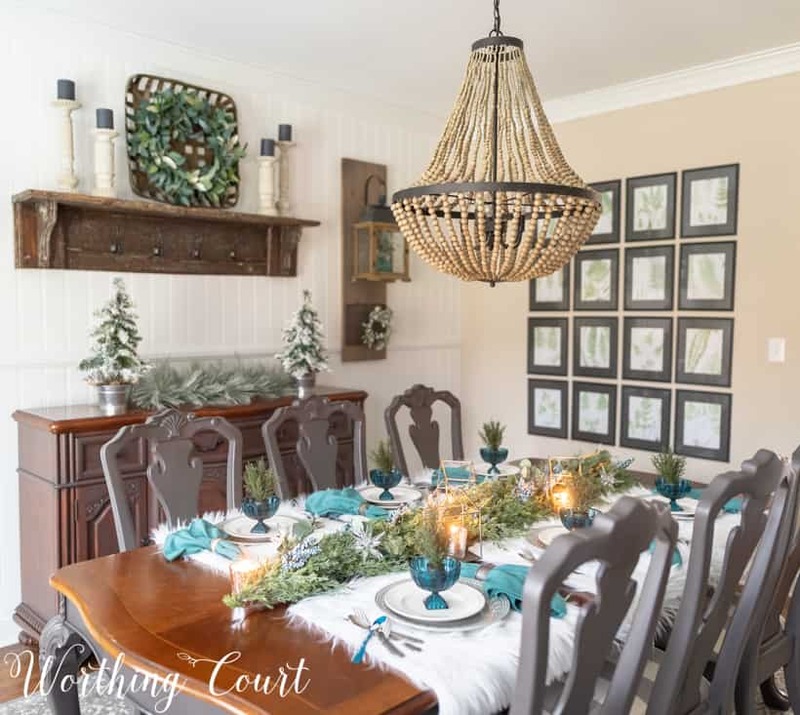 The tree, tobacco basket with wreath, buffet, chandelier and tablescape are so lovely together. I wish you and your family a Merry Christmas and do enjoy that beautiful dining room this year!!!! Hi Jean. Thank you so much for your sweet comments! I bet teal is gorgeous with coral! Yes, I just cut the rectangles of fur out and did not hem the edges. It doesn’t ravel, but the fur does shed some along the edges when you disturb it. Merry Christmas to you and your family as well! Thank you so much, Larissa! Merry Christmas! I love the dining room! 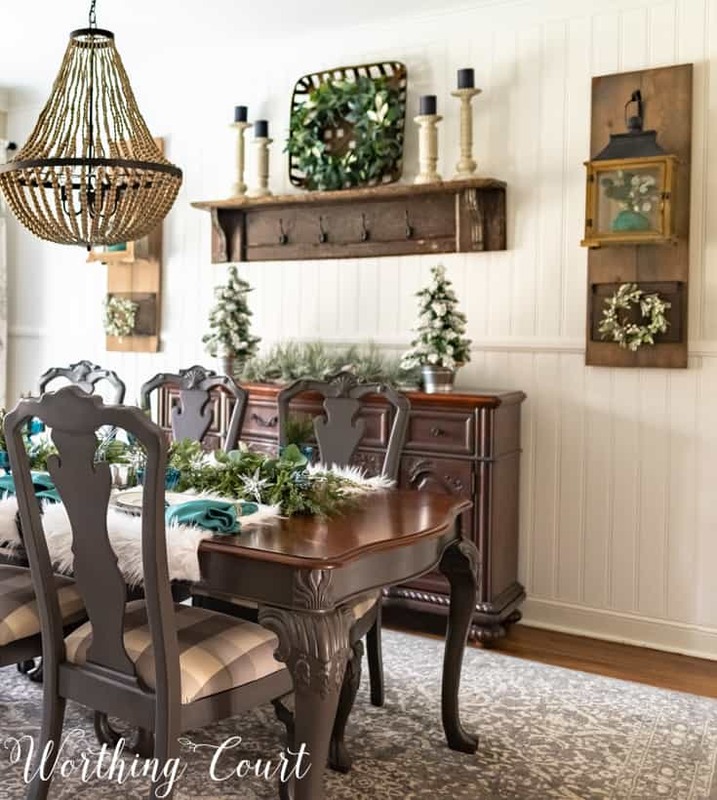 I especially like the faux fur as placemats, it looks absolutely stunning, although with my family it would be a nightmare. If I was to duplicate the placemats would only be for “lookie lookie” in my home. Your dining is gorgeous. I especially love the faux fur placemats.happy happy holidays to you your family and friends…..From Corfu Greece XOXO. Thank you so much, Barbara! From one side of the world to the other, a Very Merry Christmas to you and yours as well! Love the color of toy table. Did you paint it?